Contemporary sculpture seems limitless. There are no restrictions or boundaries to this form, which can be a caveat of immense freedom. It cannot infer a singular meaning; contemporary sculpture itself struggles with the distortion of interpretations that the viewer finds within the piece. Jun Kaneko offers his audience a fresh insight and perspective in his rarely seen and exhibited body of work From the Collection: Jun Kaneko’s Special Project – Fremont Dangos and From the Collection: Jun Kaneko’s Stacked – An Exploration in Density and Line. The works in both exhibitions have been donated to KANEKO, the first gifts that will be part of a permanent collection to be on view in its future collection building on its campus at 11th and Leavenworth Streets. KANEKO is currently conducting a Capital Campaign to raise funds for this new venue that will house the KANEKO’s permanent collection, the core of which will be donated by Ree and Jun Kaneko. Kaneko is one of the early pioneers of large-scale sculpture. His pieces are visually stunning and a bit daunting because of their massive size. Kaneko toys with scale and composition that makes the viewer think about the context of the space they are in which is almost spiritual, but at the same time there is so much fluctuation that surrounds the viewer. 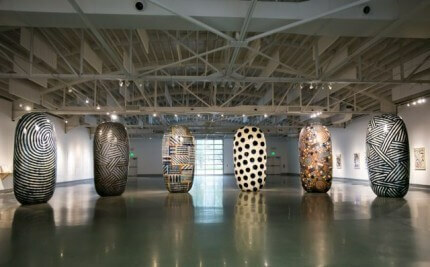 The moment you walk into the gallery you encounter six large Fremont Dangos each with its own distinctive personality. Dangos are curved ceramic sculptures that look like an elongated pod. The Dangos glazes have a subtle hue. Brown, taupe, and creams make up the undertone of the pieces which is juxtaposed with an overlay of color, patterns of dots, lines and swirls. Each piece has a great deal of movement about it that seems to takes on a life of its own. You can feel the energy, but you can also sense how small you are within the space shared with the Dangos. The playfulness of the sculptures guides our eyes to the sketches on the wall. There is an overlay of common ground where the sketches have hints of foreshadowing of what the giant Dangos would be. The whole process has been documented and can be viewed alongside the sculptures. On the second floor, this exhibition is composed of six “sound sculptures.” Three of the sculptures are made with fused glass and three are comprised of elongated ceramic planks. These three-dimensional lattice boxes look so delicate and fragile in appearance, but the strength lies in the vibrancy of the sculptures and textures created in the construction. There is so much purity to Kaneko’s work. It is a celebration of nature and the intensity of color that surround us. There is a quiet peacefulness to the “sound sculptures.” Light and shadow play such an important role. The viewer can feel like they are a part of the work by the way they move around the pieces. There is always a fresh interpretation and perspective to Kaneko’s work. It is important to think of these colossal sculpture pieces in terms of overlapping links between aesthetic practices in which they are made and the contested dialogue within us. We need to ask where do we stand in regard to them and are we listening to what they have to say.